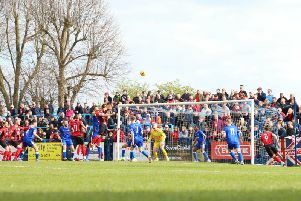 Kettering Town’s charge towards the Evo-Stik Southern League Premier Division play-off places continued with a 1-0 win over Slough Town at Latimer Park. Wilson Carvalho hit the only goal of the game in the second half as the Poppies made it seven matches without defeat. There were few chances in the first half as the wind and rain made conditions tough. The closest the Poppies came was when Spencer Weir-Daley shot inches over the crossbar while Lewis Putnam was off target with a couple of efforts for the visitors. Weir-Daley shot over again in the second half but the Poppies did take the lead just past the hour. David Popa found Ben Stephens and he played in Carvalho who fired home. And that goal proved to be enough for the Poppies as they maintained their push for a top-five finish. Marcus Law’s play their fifth home game in a row on Easter Monday when they host Bedworth United. Corby Town and Hednesford Town battled out a 0-0 draw at Steel Park and it’s a result that does nothing to help either side in their bids to survive the drop in the Vanarama National League North. As expected, Tommy Wright started himself for Corby while Taylor McKenzie made his debut after joining on loan from Notts County. But Wright lasted just 20 minutes as he pulled up with a hamstring injury and was replaced by Ben O’Hanlon who rejoined the club in the week. Corby should have taken the lead late in the first half. Nathan Hicks seized on a mistake and raced towards goal, he squared for Mills but his shot was cleared off the line by Shelton Payne. Then Ben Milnes was brought down in the area by Kennedy Digie but Mills blasted his penalty wide of the target with goalkeeper Dan Crane going the other way. Donkin saved from Shelton Payne after the break while O’Hanlon had an effort blocked and Hicks volleyed just wide for the hosts. But Donkin was forced to make an even better stop soon after when he denied Ngamvoulou from close-range after good work from substitute Paul Ennis. Ogilvie saw a shot deflected wide but neither side came close to a winner after that. The Steelmen will now head to leaders Solihull Moors on Easter Monday needing a victory to give themselves hope of avoiding the drop. AFC Rushden & Diamonds halted a run of four successive defeats as they drew 0-0 with fellow play-off contenders Northwood in the Evo-Stik Southern League Division One Central at the Dog & Duck. Diamonds enjoyed the majority of possession in the opening half and, after Jason Lee had seen a header easily saved, the hosts went close to taking the lead when Claudiu Hoban’s shot went just over after he cut in from the left. Hoban’s corner was headed off the line and then Andy Hall was off target with a header of his own. Hoban had an effort blocked early in the second half and then shot wide from 20 yards. Matt Finlay’s first action saw him saving a fine 25-yard strike before Tom Lorraine shot over after more good work from Hoban. But neither side was able to make a breakthrough and Diamonds will now look forward to a trip to Arlesey Town on Easter Monday.